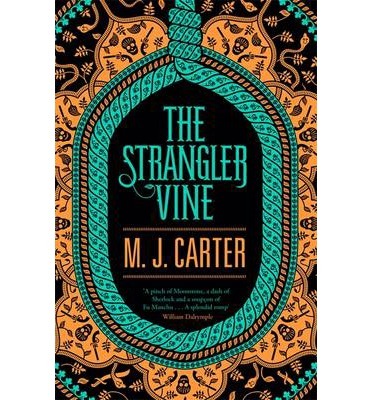 I’m halfway through M.J. Carter’s debut novel The Strangler Vine and am loving the mix of history, mystery and Victorian sensation reminiscent of G.W. Dahlquist’s The Glass Books trilogy with a whiff of Wilkie Collins’ The Moonstone. Set in India before the Raj when the British East India Company still controlled vast areas of the country, The Strangler Vine follows Jeremiah Blake, special agent and soldier in the East India Company who has gone native, and his reluctant side-kick, the uptight junior officer William Avery, who are sent on a mission to track down a missing writer who has been sniffing around things that should have been left alone. So when Penguin kindly invited me to the launch party at the London Review Bookshop thrown by John Lanchester, author of two of my favourite books, The Debt to Pleasure and Fragrant Harbour, and who turned out to be Carter’s husband, I leapt at the chance. It was a lovely evening of wine, snacks and scintillating conversation. It was great to chat to Carter about her love for historical research (she has also written a number of non-fiction books as Miranda Carter) and I was pleasantly surprised when she asked me if my blog name, chasing bawa, had anything to do with the architect Geoffrey Bawa (yes it does). And I spotted Kazuo Ishiguro there too! *but do obviously check the terms and conditions regarding rights and copyright. Glad to hear it was a good one. I got an invite but too much other stuff happening so couldn’t make it. I hadn’t realised the author was a woman, much less that she’s married to Lanchester! Small world. A word of warning about Amazon for bloggers. If you post a review on the site, copyright automatically belongs to Amazon and not you. Hence I deleted all my reviews and affiliate account with them about 7 years ago. You would have really enjoyed yesterday but hopefully I’ll get to see you soon! Thanks for the warning about Amazon – it is something I was wondering about. But what about Goodreads? sounds like a great story. did you speak with Ishiguro?? Ishiguro! 🙂 I loved The Remains of the Day. I desperately wanted to go – but there were no trains from Didcot that night. Lucky you. Was it because of the weather? I was expecting to see you and some others too but the Penguin ladies took good care of me. Much flooding of trains around Reading is making any idea of coming up to London for the evening a bit hairy at the mo – but fingers crossed that it’ll be OK for the Penguin bloggers night in March. Yes, I’m hoping to see you there Annabel!